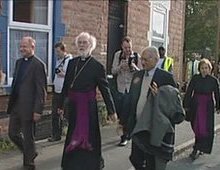 See Archbishop of Canterbury in three day Derby visit (image from BBC NEWS DERBY) Andy Ward of St Augustine's Normanton, Derby, out in Normanton with Rowan Williams. This morning I went to see Rowan. He is visiting the diocese where I serve and we (ordained and training clergy and ministers) listened to him talk about Making a Witness in the Public Square. Alastair introduced the AB of C with words about blessing and how yesterday became an an example of what it is to call down blessing on people as the AB of C walked in Normanton along Normanton Road in the heart of the city where there are 24 different Christian faith establishments and various other faiths besides, and yet the atmosphere of the road became bound up with this person (the A B of C) as a moment of significance stirred people who flocked to feel and receive a blessing. Alastair described this moving moment where encounter was created and how as a church we have this capacity to bring together many different groups whom we would never normally see conglomerate. Here he was referencing the ‘Making a difference’ debate at Pride Park with the AB of C and Lord Hattersley, a former Labour Government Minister, Ms Dianne Jeffrey, Chair of Age UK, and Mr Colin Walton, Chair of Bombardier England and Ireland, where each had presented to an audience how society is affected by their particular specialism (faith, politics, the voluntary sector and business) the evening before (23rd September). So in making a witness in the public square, how do we step up to this in our day-to-day life in the church? Rowan began by referencing Acts 26:26 and 'These things were not done in a corner'. Here is Paul before the tribunal. What he insists has been going on is something public. It is notorious. People can not but be aware of it. Christianity started as a visible shift, about how people live together. It is not just a set of new ideas. The imprint of the cross and the resurrection means there are new ways to respond to the world. The most obvious effect is that it created a new kind of solidarity and identity. When you come into the body of Christ, you are to be loyal to God's vision for the human race, over and above ethnic, National and even, swallow hard, family loyalties. It calls you also to be loyal to something that has not yet happened. For the Roman Empire this was seen as a rival claim. But we can not be loyal Roman citizens and in choosing not to be, death was the consequence for some. Christians work out a theology of citizenship which means that the country itself can not be treated as a god. Rowan referenced the second century Sicilian martyrs who affirmed that they would give to Caesar what was due Caesar and to God what was due God and were beheaded as a consequence. What does human loyalty mean? It is a commitment to a vision of neighbourliness, to a vision that doesn't get in the way of God's vision. If there is a point at which the state says that they have an absolute claim on you, it is right to perceive that loyalty to Jesus Christ has implications for how we live together. You won't be surprised to hear this: the Roman Empire got it wrong. The Roman Empire got it wrong in seeing Christianity as a rival claim. But the church was a great, big organisation. It was one legal system against another. The church has to step back and not compete for territory. To borrow Bonhoffeur's language, it has to speak about what is ultimate and penultimate. It has to be committed notoriously to God's vision for the human race. Rowan anchored much of what he spoke about in the work of William Stringfellow, who died in the 1980s: a Harvard Law scholar and lay theologian, Episcopalian and nuisance! 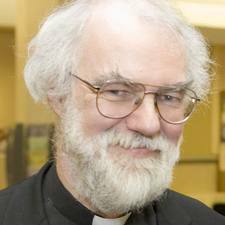 Stringfellow was critical of the clericalising of the church, we are not to be ceremonial and superfluous lay people. He set up Bible studies in Harlem amongst the knife gang culture with typically uncompromising expositions of the Book of Romans with references to the Greek. He was obstinate and courageous, with an absolute passion for the bible. He differentiated between being a religious person and a biblical person. He stood in fear and trembling before a living God. The Gospel is to be a notorious proclamation. Rowan quoted from 'Conscience and Obedience,' written in the late 1970s. This book explains how the Church is to be an exemplar - speaking God's vision for a renewed creation, presenting this to whatever political authority there is around, telling that authority that it has a vocation from God. Vocation is different from blessing, it is a responsibility to join in with God's call to combat the fear of death in the world, however that manifests itself, internally or in external oppression. Whether it realises or not where this vocation comes from, it is to push back these forces in the name of Christ. Karl Barth championed this vision too and when Stringfellow attended his seminar in the 1960s, Barth declared that all of America should be listening to Stringfellow. 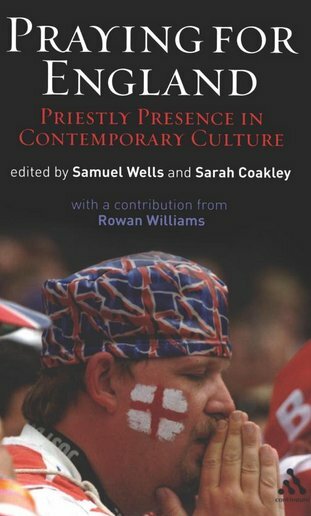 Rowan went on from this, inspired by Stringfellow, to describe how the church is the only real community with real legitimacy. It has a legitimacy that rests on God's law. We are to throw our energy in with it. Stringfellow is writing against the backdrop of the Vietnam war where draft resistors like him were imprisoned and indeed he was wanted by the FBI for harbouring resistors on the run. He was also in a gay partnership which means he is interesting reading for evangelicals who find this hard to square with his uncompromising biblicism. When is it right not to obey the law, asks Stringfellow...when the law seems to be going in the opposite direction to God's vision. Stringfellow proposes vocal advocacy - we do this and we take the consequences. Civil disobedience is not something Christians should never consider. We have to be able to say to the state - by what authority can you do this if it defies a Godward direction? So what does it mean to witness in the public square? It is not about our being a community of outstanding virtue. We are to be a community with global loyalty and solidarity to the vision of humanity restored to God. We do not embody God's vision but we witness to it. Other kinds of authority are all measured against this. It is all to be judged against God's purpose. This is not about a few exceptional martyrs but about the church. When we baptise we are committing that child to a life under a particular authority, we are speaking to them of a vocation. What do we think we are doing? We are bringing them into a society. We had better help them live in it. What holds the church back from being that kind of witness? Shanks is witty, searching and engaging. His is a down-to-earth, pragmatic theologian, envisioning a solidarity that lies beyond conventional politics. The challenges for us are how we translate Stringfellow's passionate response in the C of E today. Stringfellow does not write about the C of E and he would have found it difficult!. It is embroiled with the state and muddled in its loyalties. 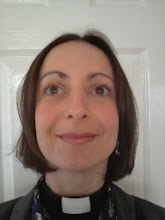 Grace Davie, who writes passionately about belonging and then believing, writes also about the strengths of our being a weak institution. We no longer have the power to put presbyterians in jail! We have lost our hegemony but we are still there in the public square. People project upon us their fantasies, their hope and their contempt. We have to be committed to being notorious. Ours is a commitment to being visible. How do we make the most of this? To test everything according to that. Ask critical questions - are we, are you, moving in the direction of God's vision for humanity? Are we defending our territory or a hope for human fullness? Defend instead a vision for humanity! Bonhoffeur wondered from prison which he had really defended but he could wonder because at least he tried. We are to defend humanity against the forces of death. We need a loyalty that transcends institutional loyalty. We defend this because of Calvary and because of the empty tomb (this is not humanistic and optimistic) this is rather what we are all about and this is how we are called to be different. The ABC then answered questions ranging from what his response is to Robert Mugabe, whom he will meet, to the challenges of rural ministry, to bemusement over callings that were to the pastoral over proclamation, to the challenges of speaking relevantly into environmental issues. In amongst the answers he gave, he spoke about doubting that he would ever, like Jonah, be surprised by a Mugabe taking on the attitude of the penitent Ninevahn King. He explained his lack of comfort with any redefinition of the meaning of marriage. He spoke about what it really means to pastor in that it is not about stroking and maintaining but feeding people to grow. He also spoke about his delight with Fresh expressions, that the church renews itself through movements of the Holy Spirit, that he can talk about what the church is doing by visiting dioceses like Derby in the way that he does. He ended on our round of applause in response to his attitude to those who threaten schism: he told us somewhat wittily how he invites them instead early into the inevitable ecumenical partnerships that we will increasingly find ourselves being called into! I will be sad if the rumours of Rowan resigning are true. I think he's an amazing ABC. Stringfellow's thinking sounds really interesting. I must check him out.